Bikash Roy and Bengali classic films. Bikash Roy had been one of the educated actors of Bengali classic films who had acted in different types of roles. In Uttar Falguni, he played the role of a barrister in Kolkata High Court who could not marry Suchitra Sen as he went to study abroad but after coming to know that she had become a tawaif due to circumstances he taught her daughter and made her a barrister who pleaded the murder case of her mother at the end of the film. The performance of Bikash Roy had the compassion for his wife and love for his daughter. He was sublime in the dynamic role. Ashok Kumar played his character in the hindi film Mamta made on the same story. He had acted opposite Suchitra Sen in other films like Sreeti Tuku Thak, to Surjo Toron and Sandha Deeper Sikha. In all these films his mellifluous voice had made the viewers spell bound. He also directed notable films like Basant Bahar which was based on music of ustadi gharana, Morutirtha Hinglaj which was based on story related to tours and travels and Surjotapa. He had very good comedy instinct which was displayed in the film Chele Kaar, where an unknown child one day sat in his car in a Park in Kolkata and called him his father. He could not leave the child anywhere and had to accept him as he was attached to him and Arundhuti Debi, his wife. Chabi Biswas acted as the father of Bikash Roy and also showed his dynamism in the field of comedy and film became super hit in the early 50s. Bikash Roy was elegant in the comedy role in Choddobeshi opposite Uttam Kumar. His role was played by Om Prakash in the hindi film Chupke Chupke. Due to his capability of modulation of the voice he got a scope of acting in negative roles starting from Jighangsha, where he was deprived of property of princely estate. He took revenge by killing each of the princes. He was ultimately arrested by the detective in the film. The film was remade in hindi with the title Bees Saal Baad. 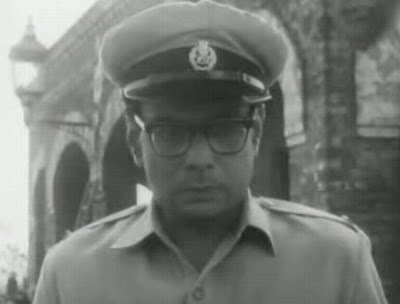 Bikash Roy was sublime in his role in Tapan Sinha’s film Arohi, where Kali Banerjee was his compounder. He was a doctor and after his death his compounder shed his blood to bring up and educate his child. His other notable films include Arogyo Niketan, Dadu, etc. If Uttam Kumar and Suchitra Sen had made Bengali films reach its level of excellence with their romantic performance then Bikash Roy had facilitated their stories with the diversified characters he had played for a period of 30 years. He was an indispensable actor of Bengali films and his films should be restored for those reasons. Undoubtedly, the finest artist of bengali cinema. His voice , dialog delivery , command over english language certaily gives him the status of a legend. Nice article! Thx 4 sharing! Was doing a google search on Jighangsha and found your blog, nice space you have here. Sonu Niigaam's recent songs in bollywood films. Farooq Sheikh and bollywood films. Govind Nihalini and realistic films. Bosonto Chowdhury and classic films. Music in Satyajit Ray films. SD Burman and Dev Anand.